Knowing from my research in preparation for this trip, and now from my conversations with local officials, how much people look to the region for its unique solar and renewable energy technology cluster, it was easy to understand why Freiburg Uni has responded by developing strong academic programs that educate future green industry entrepreneurs, leaders and policy-makers. Dr. Stefan Adler arranged for my lecture to his graduate students in the most rapidly successful of these programs – the MS degree program in Renewable Energy Management (REM). 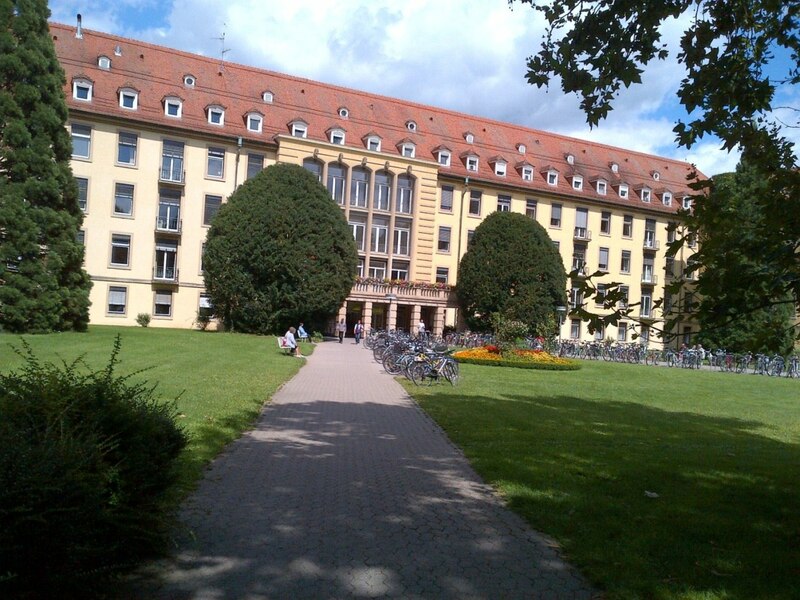 He also told me about the partnership between his academic home, the Center for Renewable Energy, and the government-funded Fraunhoffer Solar Energy Institute, located about a mile away from the Center beyond the sprawling Freiburg Uni hospital and medical school campus. REM faculty members conduct research, lectures, seminars and conferences at the Fraunhoffer Institute. I walked there and saw several arrays on and around the building and, inside, a display promoting the institute’s impressive 5th annual International Solar Summit, scheduled for this October in Freiburg. 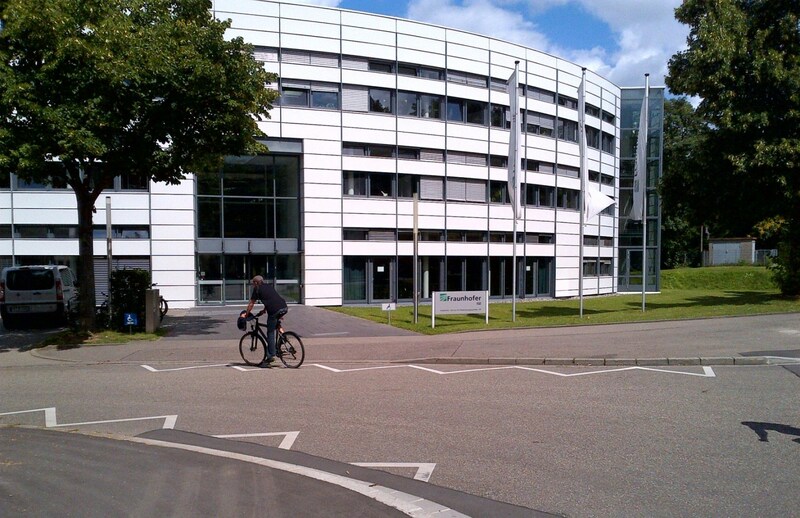 The main entrance to the Fraunhoffer Solar Energy Institute (above) is a 20-30 minute walk from the Center for Renewable Energy on Freiburg Uni’s campus. Dr. Adler and other solar faculty members partner with the government-funded institute. 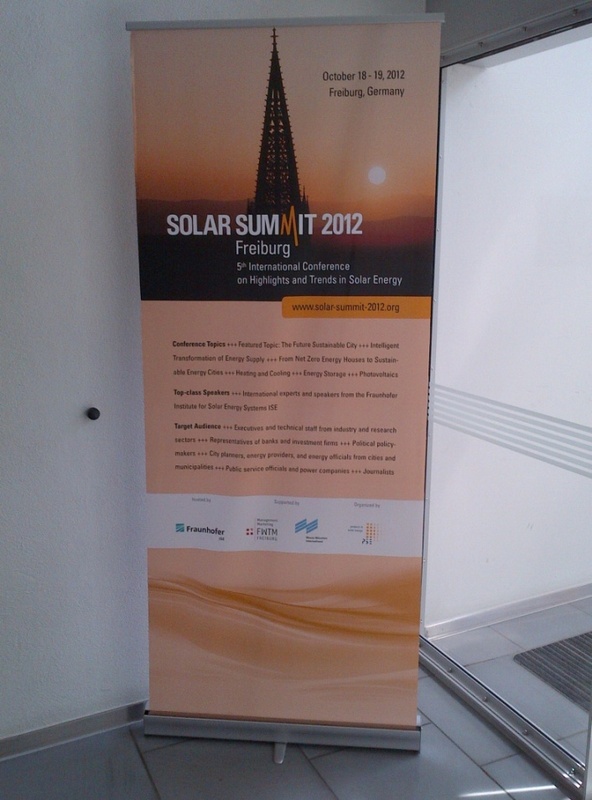 A display in the institute’s main lobby promoted the upcoming 5th annual Solar Summit in Freiburg. Dr. Adler’s 29 REM graduate students from 20 different countries were bright, engaged and fluent in English, a requirement for admission. I presented an overview of UConn’s sustainability initiatives and activities, focusing on our 2010 Climate Action Plan (CAP) for a carbon-neutral campus by 2050 and delving into our progress in implementing several energy and transportation related strategies. When I spoke with pride about how we’ve made UConn’s very clean and efficient cogeneration facility the central energy source for an increasing number of campus buildings, the student skepticism about the cogen’s natural gas fuel source was palpable but polite. Nonetheless, I explained, our 25 MW cogen plant has displaced the use of less efficient boilers and generators, which used much more carbon-intensive petroleum diesel fuels, and it now supplies nearly 80% of the heat and power for our main campus. The students had a similar reaction when I told them about UConn’s installation this past spring of a 400 kW UTC Power hydrogen fuel cell at our Depot Campus. The fuel cell extracts hydrogen from – you guessed it – natural gas. Then, through a catalytic process, instead of combustion, it generates most of the electricity and some of the heat for the Depot extension of our main campus. Each year, this fuel cell will avoid the consumption of millions of gallons of cooling water and the emissions of many air pollutants, including 800 tons of CO2, versus the conventional power sources that would be needed to produce a comparable amount of energy. The REM students pointed out: “But natural gas is 100% fossil fuel! How can that even be a bridge to a truly sustainable strategy? Isn’t the US just delaying the transition to renewable energy by switching from one fossil fuel to another, coal to natural gas?” I think most of them understood the economic and political realities in the US, and elsewhere around the globe, that have made the transition to renewable energy slower than any of us would like. But they raised good questions that led to a lively discussion. One student encouraged me to develop more ambitious interim carbon-reduction targets for UConn’s CAP. I loved the students’ passion for renewable energy and enjoyed our policy-level dialogue. Dr. Juergen Steck, my principal Freiburg Uni host and counterpart, who is the “Umweltschutz” director overseeing both environmental compliance and sustainability, filled me in on the use of renewable energy in campus operations. He was one of the university project leaders charged with meeting the 550 kW goal of the Solar Uni initiative. He and his staff of nine, including a climate protection manager, keep meticulous records and file detailed reports about greenhouse gas emissions from campus operations. They also maintain data about metered and un-metered energy use in campus buildings as well as energy production from various sources, including solar power. At his desktop computer, he opened several Excel spreadsheets and graphs that had been prepared to ensure compliance with Germany’s climate protection laws. In our conversations, Dr. Steck shared his concerns that the campus had literally run out of rooftop space for additional solar arrays. Based on the abundance of arrays and several green roofs already installed on campus buildings, he worried whether there would be any remaining rooftops available with the necessary characteristics: proper orientation to sunlight, structural integrity, and at least a 20-year remaining lifespan. 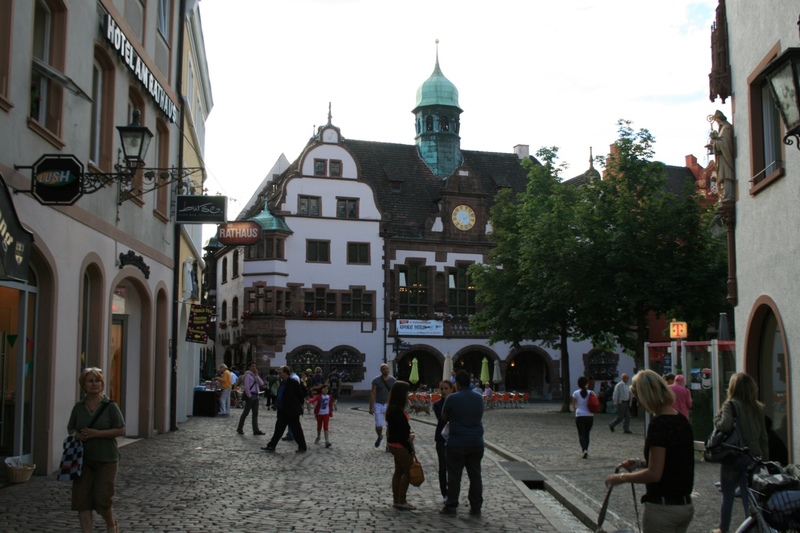 As in the US, a number of Freiburg’s older campus buildings are protected by historic preservation laws and remain off-limits to solar panels. 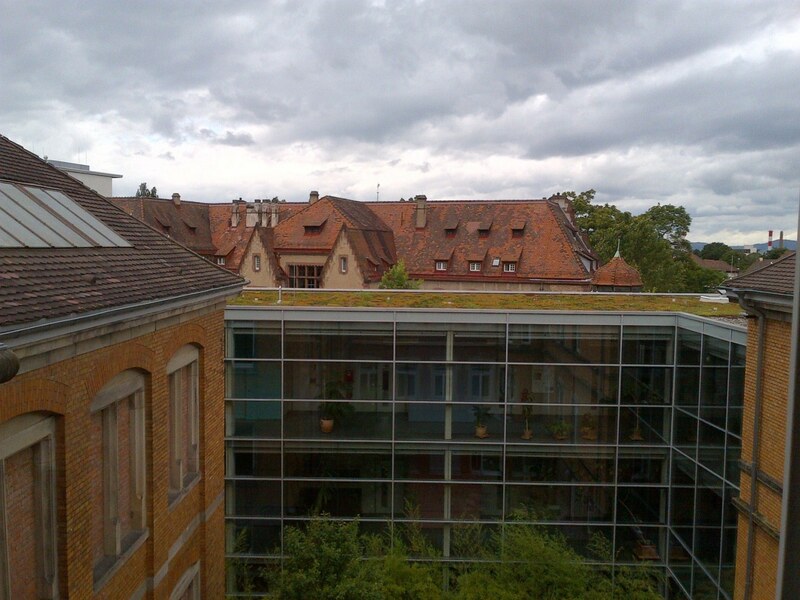 According to my Freiburg Uni counterpart, green roofs like this one, which was visible from the upper-floor offices across the quad, along with 550 kW of rooftop solar arrays already installed, have used most of the available space on campus for future solar installations. 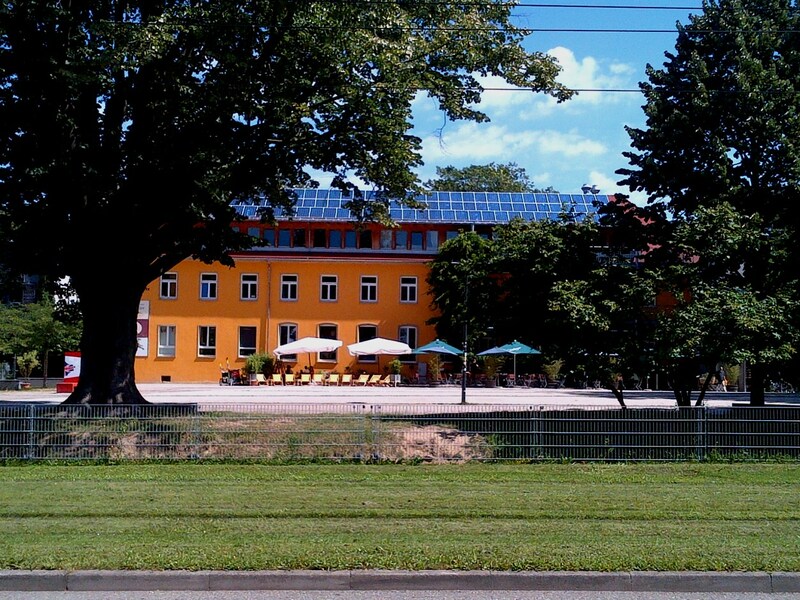 Beyond solar, the rest of Freiburg Uni’s energy picture is also tinted green. Dr. Steck explained how the campus uses groundwater for geothermal cooling of half of its buildings. It’s a non-consumptive, non-contact cooling use of the naturally cold water drawn from the aquifer underlying the university’s campus. His department’s job is to make sure that the water is returned to the aquifer, after its use, free of any chemicals or other contaminants and no more than 5 degrees Celsius warmer than when it was pumped out. 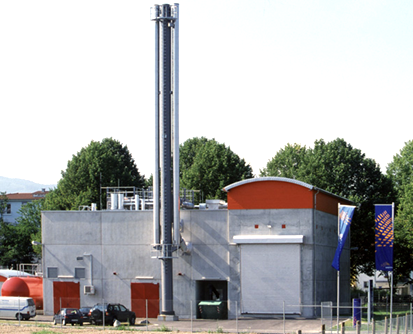 For the rest of the campus heating and cooling needs, he told me that, only recently, after a long and careful analysis, Freiburg Uni switched from burning coal at its central utility plant to burning biomass, comprised of wood chips from a sustainably-harvested local forest. Despite all of these green energy attributes, I wondered how much the typical Freiburg undergrad was aware of the university’s commitment to sustainability and renewable resources. At UConn, we’ve just completed our Renewable Energy Strategic Plan for deploying demonstration-scale sustainable energy projects on our campus over the next five to seven years. For us, the public visibility and academic accessibility of future projects were, and will be, important site selection criteria. We hope to integrate tours of these installations into various courses, from science and engineering to the humanities. 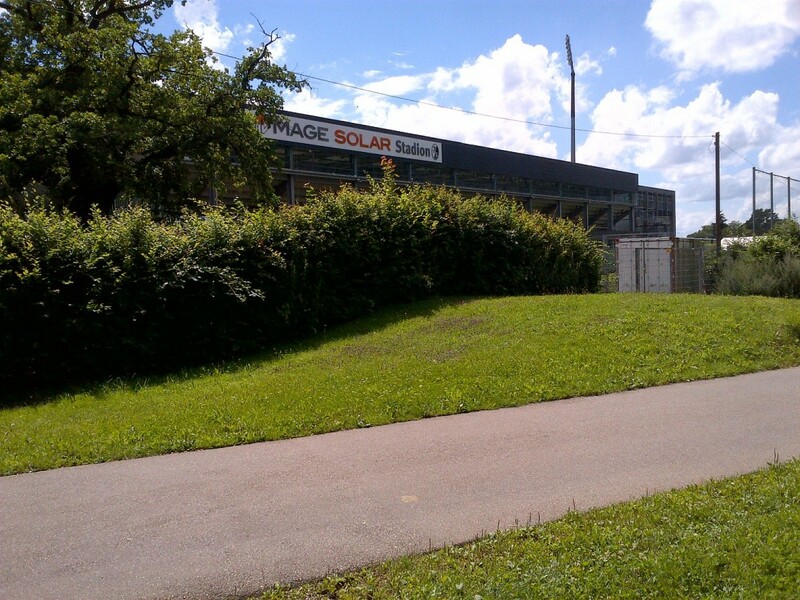 At Freiburg, on the other hand, none of the Solar Uni rooftop arrays was visible, much less accessible, to students or the general public. I was told the university had installed an energy dashboard, not at the student center or a large classroom building, but at the Rector’s inner-city office, blocks away from academic buildings and daily student traffic. Maybe when your campus is in the middle of Germany’s “Green City,” where renewable energy has flourished for decades and installations are commonplace, there isn’t as much of a need for high visibility demonstration projects. 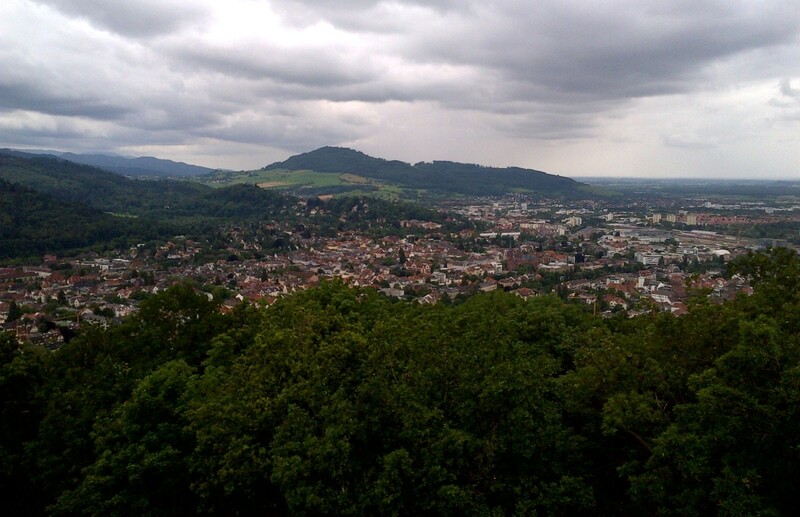 On an overcast day, wind mills in the Black Forest (center) on the edge of the city, were faintly visible from the Freiburg Uni campus. 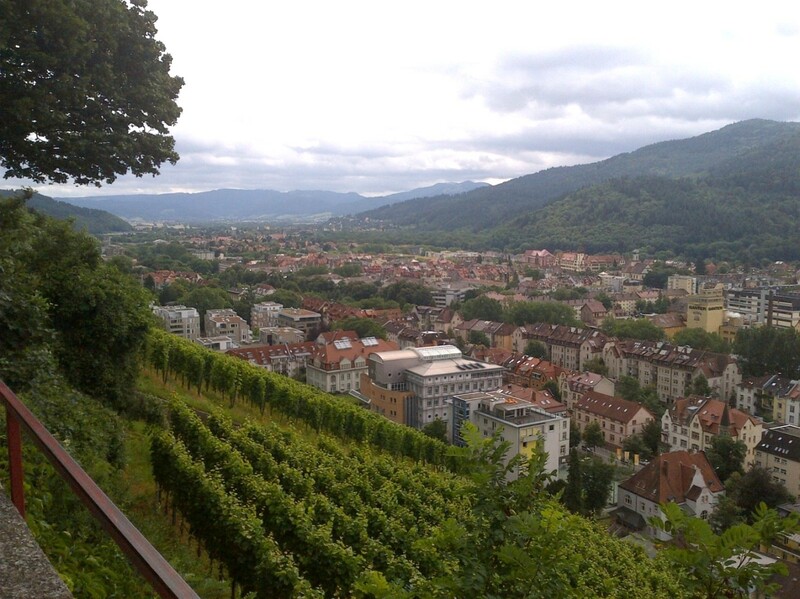 This is the third in a series of blog posts by Rich Miller, UConn’s Director of Environmental Policy, comparing and contrasting aspects of environmental sustainability at Freiburg University (Albert Ludwig University at Freiburg or Freiburg Uni) and in the “Green City” of Freiburg, Germany, with similar sustainability aspects and metrics at the University of Connecticut (UConn) and its main campus located in Storrs, within the small town of Mansfield and the rural surroundings of northeastern CT. Rich received a professional staff travel grant from UConn’s Office of Global Programs and used it to visit Freiburg over a two-week period in July 2012 for this international sustainability exchange program. What would you expect from Germany’s “solar city?” Taking advantage of the fact that it’s located in the sunniest region of the country – a relative distinction compared with the often cloudy and cool northern Europe – Freiburg has installed more solar panels than any other city in Deutschland, and more than many countries in Europe. Dr. Stefan Adler, the enthusiastic Director of Uni Freiburg’s Center for Renewable Energy, explained to me how the city’s green reputation and passion for solar energy was borne during the 1970s from a grassroots fight against a proposed nuclear facility, which was planned for an area just northwest of Freiburg, along the Rhine River. The protestors, led by local farmers, prevailed and the nuclear plant was never built. 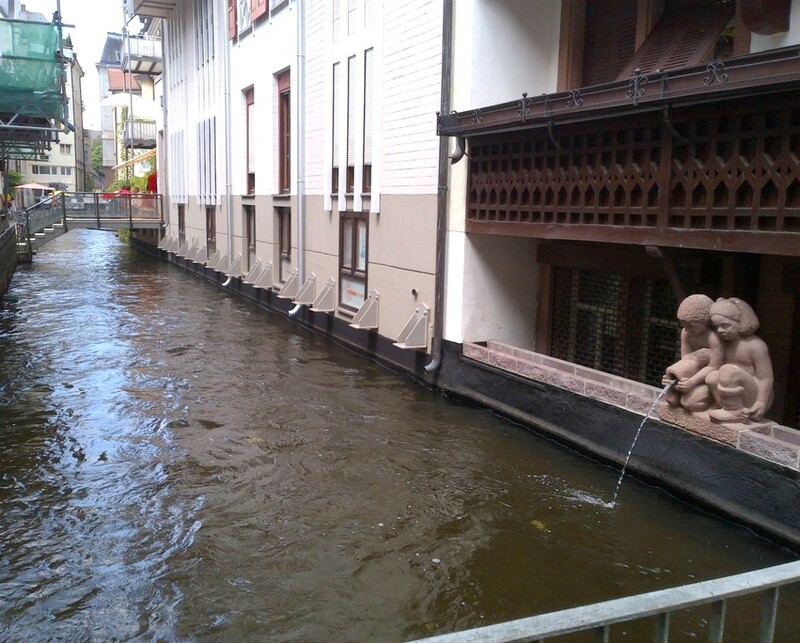 Today, the long-time Green Party mayor, Dieter Salomon, remains a popular incumbent, and solar panels, wind turbines and small hydro-electric facilities have been part of the cityscape in Freiburg for years. The anti-nuclear sentiment remains strong among the general population and, decades later, is still part of the sustainable energy message communicated by the mayor’s office and local businesses. 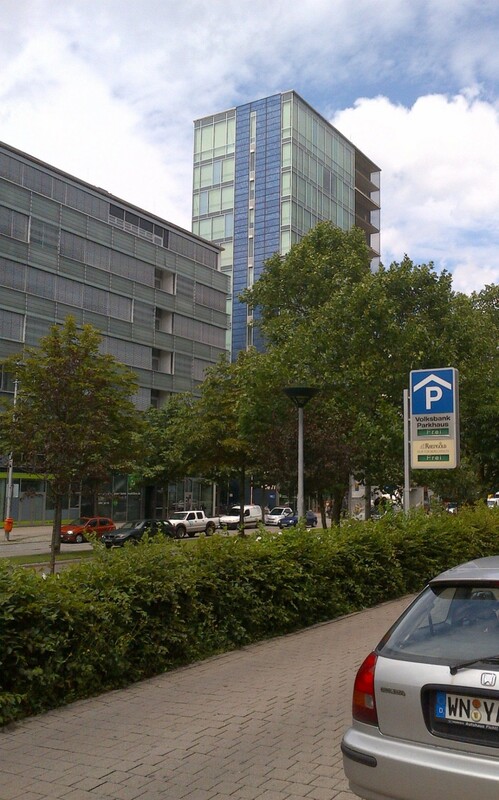 Solar panels are on many buildings in Freiburg, like this photovoltaic array on the side of an office building near the main train station. Freiburg has more than 12.3 MW of solar PV (mostly roof-mounted), which generates more than 10 million kWh of electricity a year. I met with Dr. Franziska Breyer, the city’s environmental director, in the town hall or Rathaus (a German word with an unfortunate double entendre in English), to talk about Freiburg’s plan for achieving carbon neutrality by 2050. She was busily preparing for an important meeting of a town commission that evening, when she was hoping for the board’s approval to raise the bar on Freiburg’s interim carbon reduction goals. Dr. Breyer, who is a forester by training, and a former faculty member at Freiburg Uni, was also pressed for time because her job title and management portfolio had recently been expanded to include youth, schools and education. With that kind of addition to her workload, I was grateful that she could spend any time meeting with me, much less an hour, and I appreciated the presentation materials she gave me from her latest annual report to town officials: “Approaches to Sustainability – traffic policy, climate protection and urban development planning in Freiburg.” Many of the facts and figures cited in this report are from these excellent presentation materials. 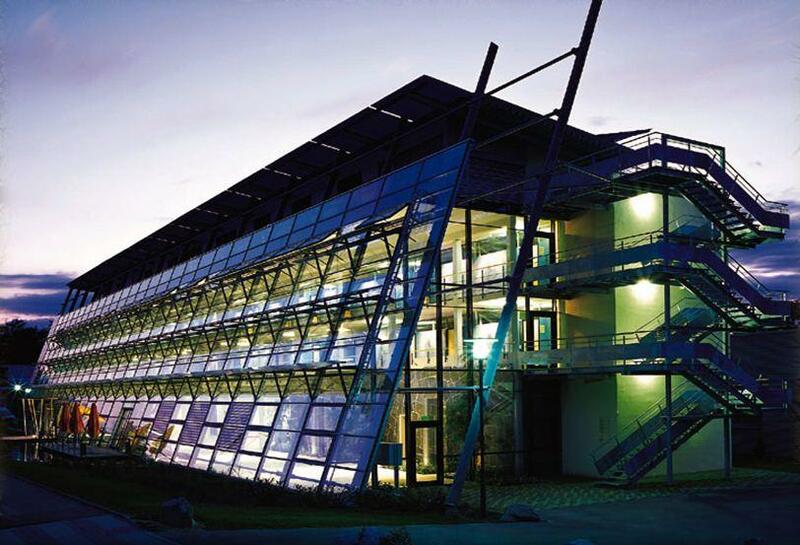 In addition to the governmental, residential and commercial building owners who have installed solar arrays throughout the inner city and surrounding village districts, Freiburg University has also made a large investment in roof-mounted solar PV. On the university’s 550th anniversary in 2007, their Rector (chief academic official) announced a “Solar Uni” initiative with the ambitious goal of installing 550 kW of solar panels on campus over the next five years. Using government incentive programs that ensure a guaranteed rate of return for solar investors, many people, including students, faculty and staff, actually acquired equity shares in these on-campus installations and, by 2012, the Solar Uni initiative achieved its lofty goal. In turn, these same incentive programs stimulated the growth of German solar developers and manufacturers, several of which are clustered in and around Freiburg. 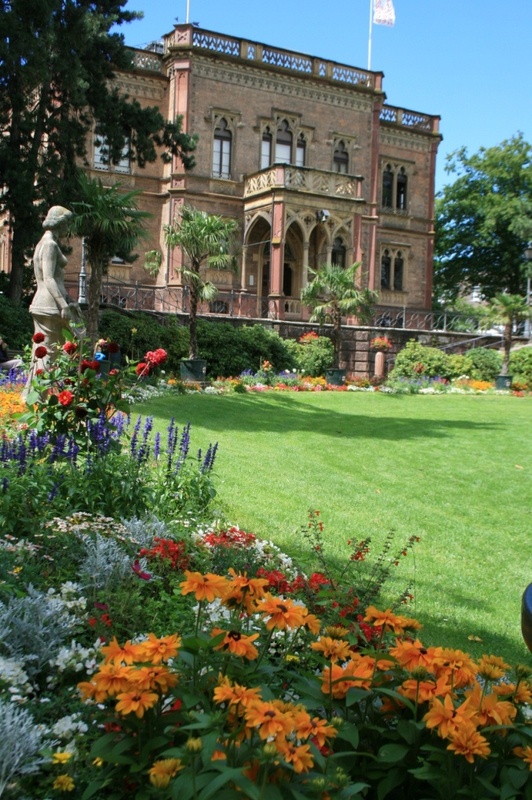 Freiburg combines its long-standing commitment to renewable energy with more recent conservation-focused laws and resolutions proclaiming goals and mandates like: (i) zero-carbon development on land that it owns, (ii) more energy efficient replacement windows on existing homes, and (iii) low energy standards for new homes. For example, in the Green City’s Vauban eco-district, which was established in the mid-1990s through the redevelopment of the barracks in a former French military base, homebuilders must ensure that new residential buildings waste no more than 65 kWh per square meter annually – a fraction of the average for most homes in northern Europe. 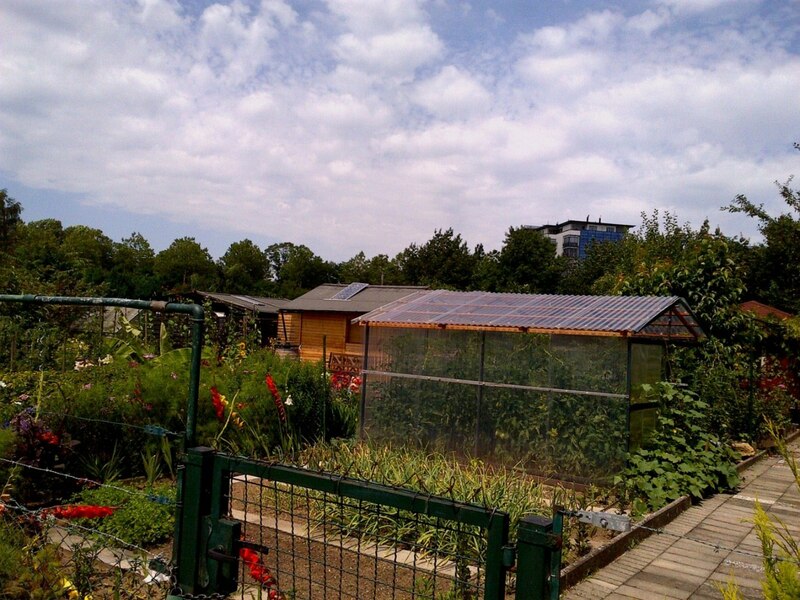 Walking down the main street in Vauban, along the two tram lines leading into and out of Freiburg’s inner-city, one sees solar panels, playgrounds and small parks everywhere. Cars are prohibited within Vauban’s pedestrian village, which also gets the bulk of its electricity and thermal energy from a centralized combined heat and power biomass plant. As I left the eco-district and headed back to Freiburg’s inner-city on the tram, I checked “Vauban” off the list of destinations on my official Green City tour map. It had been well worth my time and the four euro roundtrip tram fare, but I was thankful that I hadn’t paid 180 euros for the two-hour guided tour. 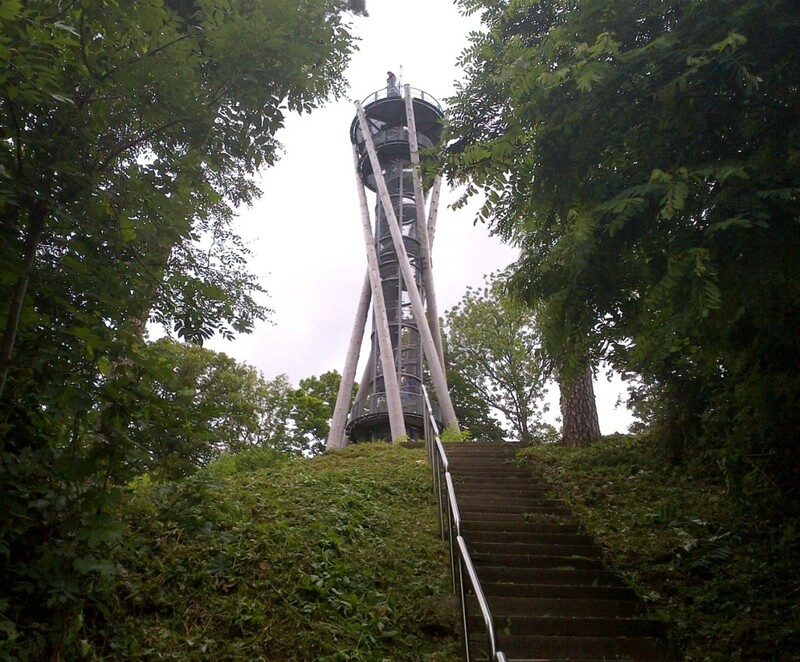 Eco-tourism is a big business in Freiburg, including group tours of man-made features, like Vauban, and nature excursions to places like the Black Forest. 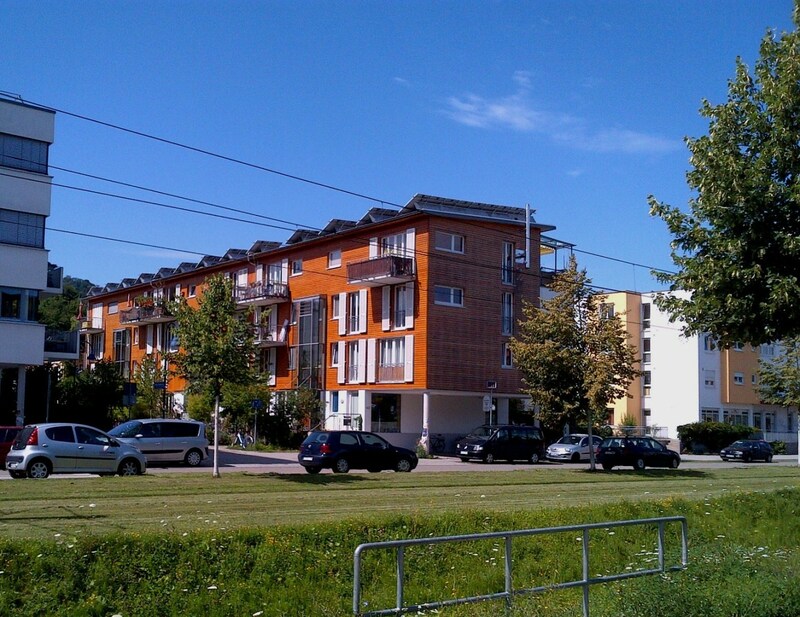 Solar panels are on the rooftop of virtually every apartment building in the Vauban eco-district. 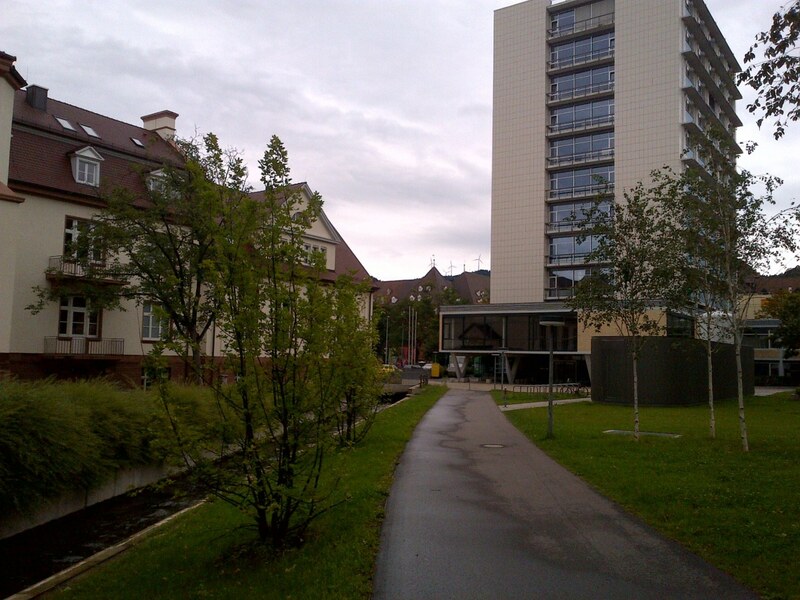 Envisioning an affordable, sustainable energy community, Freiburg developed Vauban in the early-1990s by converting the barracks of a former French military base. 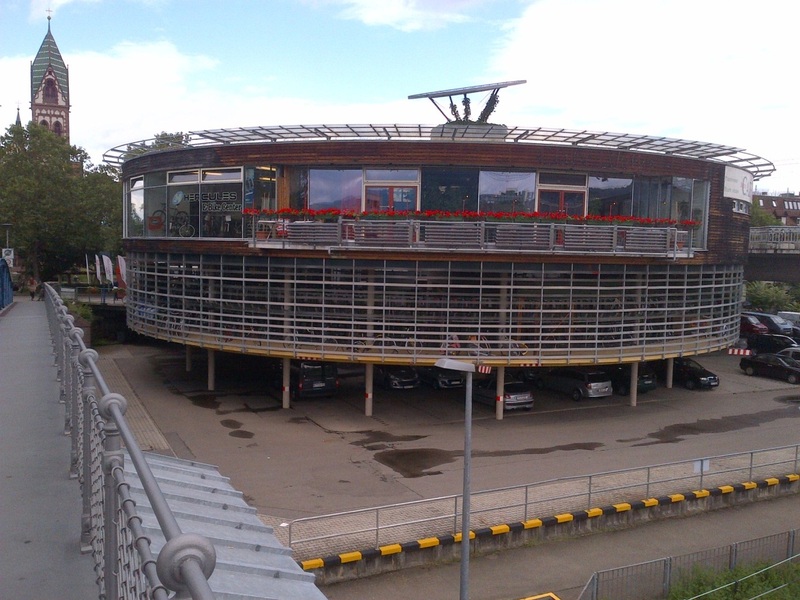 Solar panels are everywhere in Vauban, including on the rooftop of this café and commercial building. 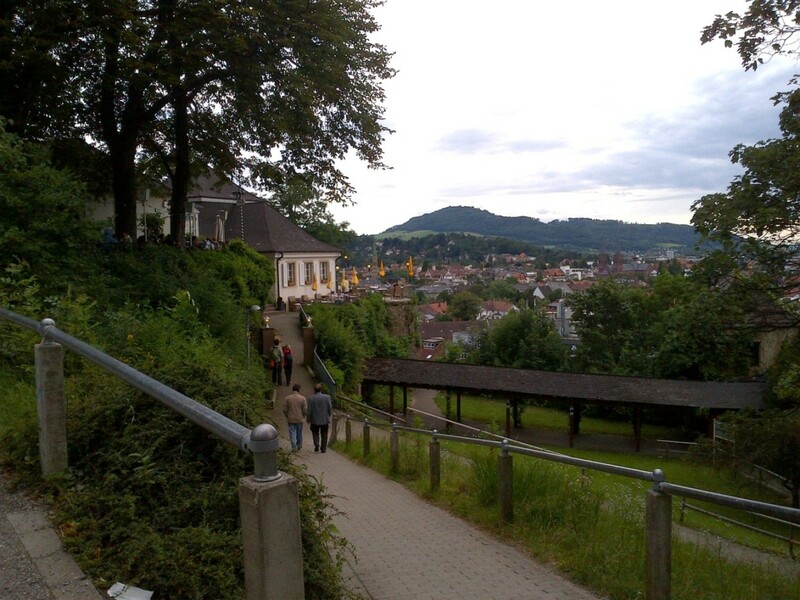 Preparing for my trip, I had read that Freiburg, a large college town by any standard (pop. 220,000), and an increasingly popular tourist destination for all of Europe, the US and other parts of the world, was not only Germany’s “solar city,” which makes sense given that it enjoys more sunny days than anywhere else in Deutschland, but also its “cycle city.” With this in mind, I had packed my bike helmet, gloves and shorts and made plans to rent a bike at The Mobile. This is a large, multi-story facility, which was built to serve as the city’s public bike station and is connected by a pedestrian bridge to the train and bus stations. I had read that as many as 30 percent of Freiburgers commute to work, class, and almost anywhere else they’re going, by bicycle – that number seems lower than what I observed. 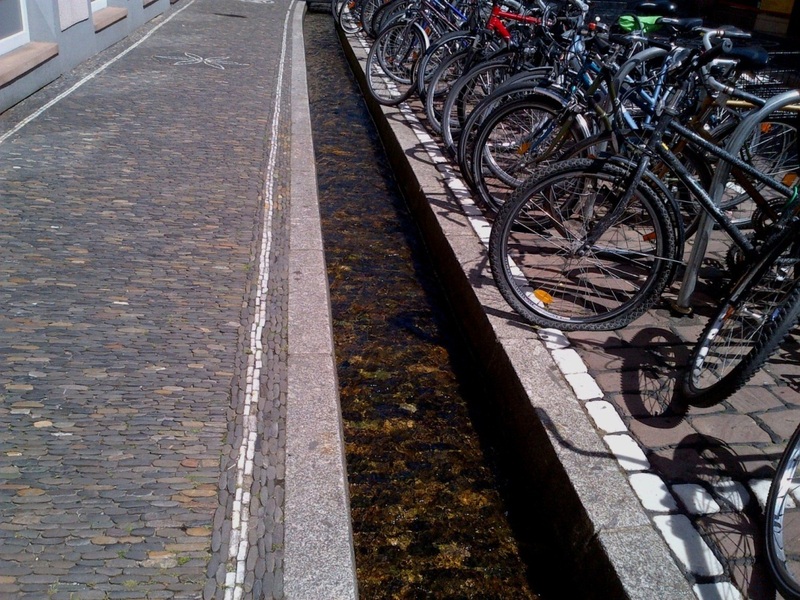 “The Mobile,” a public bike station in Freiburg, rents and loans hundreds of bikes daily. The easiest way to describe the difference between biking in Freiburg and the US, even compared to a college town like Storrs, is that bicycling here in southwest Germany, among students and the masses, is predominantly an alternative mode of transportation, certainly much more than it is a form of recreation or sport. Bikes here are mostly very practical, low-frills models with wider hybrid tires and seats, straight handlebars, and metal basket clips and fenders. In fact, most of them resemble the standard-issue “UConn Cycles” bike-sharing 3-speed models (the kind we selected to deter their theft). The expensive, aerodynamic bikes so popular in the US, like the ultra-light racing bikes, are few and far between. Upscale mountain bikes with the heavy-duty shock absorbers and hydraulic brakes are slightly more noticeable on the Black Forest’s wooded trails, which border the city and climb up to many scenic hilltops and steep “bergs.” People of all ages ride everywhere, rain or shine, day or night, in their normal everyday attire: from business suits and ties, to long dresses, skirts and skinny jeans, and with footwear from dress shoes, sneakers, sandals and boots, to bare feet. Helmets and spandex bike shorts, so popular among the “weekend warriors” in the US (myself included) are scarce in Freiburg. The Mobile is connected by the pedestrian/bike-only bridge (left) to the main bus and train stations. 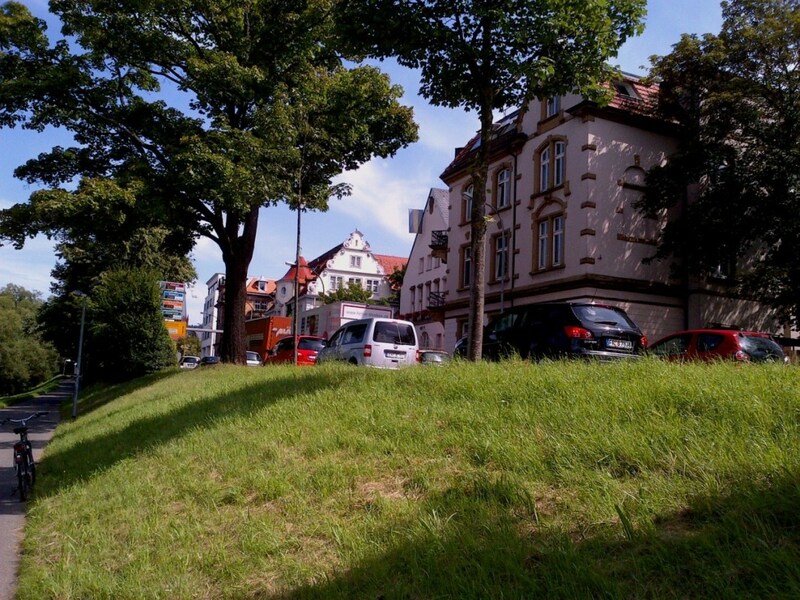 Biking here on the Freiburg Uni campus and in the city is all about getting where you need to go… quickly. My $4 Freiburg metropolitan area bike map, with the solid red lines indicating separate, paved bike trails, and dotted lines for pavement-marked lanes alongside the walkways or on the shoulders of streets, showed a network of trails so numerous and inter-connected that it looked like a half-eaten plate of spaghetti. It’s all so convenient and connected that the university has found 5,000 bike racks on campus are not enough! According to Dr. Juergen Steck, my host and counterpart at the university, this has become a problem for senior administrators, because hundreds of bikes are routinely locked to lamp posts, fences, trees and anything else fixed to the ground, becoming an eyesore and occasionally even a fire safety issue when blocking exits and access points. Help is on the way! The university will be adding 500 bike parking spaces in the basement of its new library, now under construction and expected to open next year. 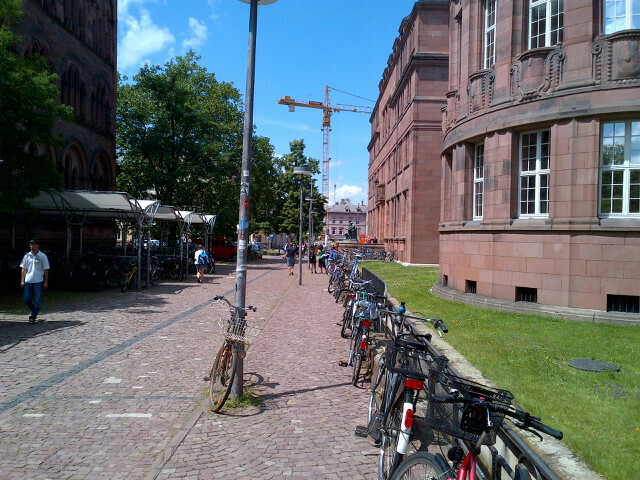 5,000 bike storage racks on the Freiburg Uni campus, such as the covered racks to the left in this photo, are still not enough! Bikes are chained to everything, like the railings and lamp posts in front of this classroom building, posing aesthetic and safety concerns. A note about bike safety is relevant here. Many times last year, when our UConn Cycles team prepared to launch the campus bike-sharing pilot program, I heard from several faculty and staff members about how they had almost been run over by a careless cyclist. They chided me that maybe encouraging more bikes on campus wasn’t such a good idea after all. So, we created a bike safety flyer, tightened our liability waiver form, took a deep breath and forged ahead. Fast forward to southwest Germany in this summer of 2012 and picture dozens, if not hundreds, of bikes fearlessly zipping along the streets and narrow cobblestone roads and walkways, often weaving through pedestrian and vehicle traffic that is every bit as heavy as it gets on North Eagleville Road (in the Science Quad) between classes, and you’ll have a pretty good image of Freiburg. Cars, bikes and pedestrians here have learned to peacefully coexist. Everyone defers to cyclists, who seem pretty attentive and experienced at avoiding collisions. However, when I remarked to Freiburg’s director of education and the environment, Dr. Franziska Breyer, that I had seen very few riders, except for pre-teens, wearing bike helmets, she seemed resigned to the fact that an adult helmet law would not be enforceable. And yes, she acknowledged, they have had their share of bike-related accidents. Those must have been involving the few adults I saw now wearing helmets. 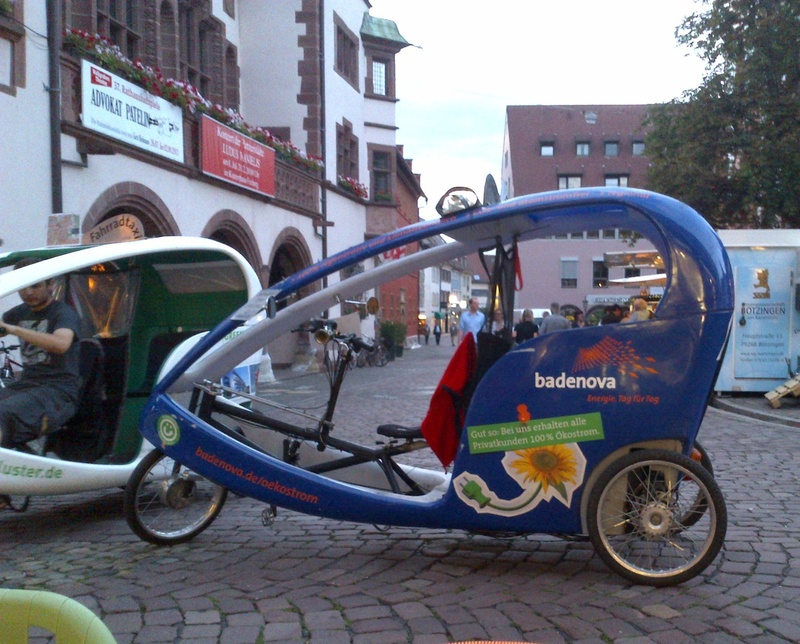 Bike taxis (and even a few passenger-pedaled buses) were popular in Freiburg’s beautifully restored and preserved Aldstadt (”Old City”), where motor vehicles were mostly prohibited. Renting a bike was less expensive than in the US (finally something less expensive!) and cost about 8 euros ($10) for a half day or 15 euros for an entire day. The 50 euro refundable deposit made me thankful that I brought extra cash in my pack. Busy staffers at The Mobile quickly fetched a well-maintained 7-speed “city bike” from the well-stocked racks of similar bikes for rent. They demonstrated the rear wheel locking mechanism, with the key that could only be removed when the bike was stopped and locked (I made a mental note for UConn Cycles), then directed me to the Dreisam River trail and sent me on my way – no liability waiver form was presented for my signature and no helmet was offered. The trail along the cascading river, stretching for miles in either direction beyond the city center, was simply one of the most scenic, smooth, uninterrupted and enjoyable bike paths I have ever ridden. 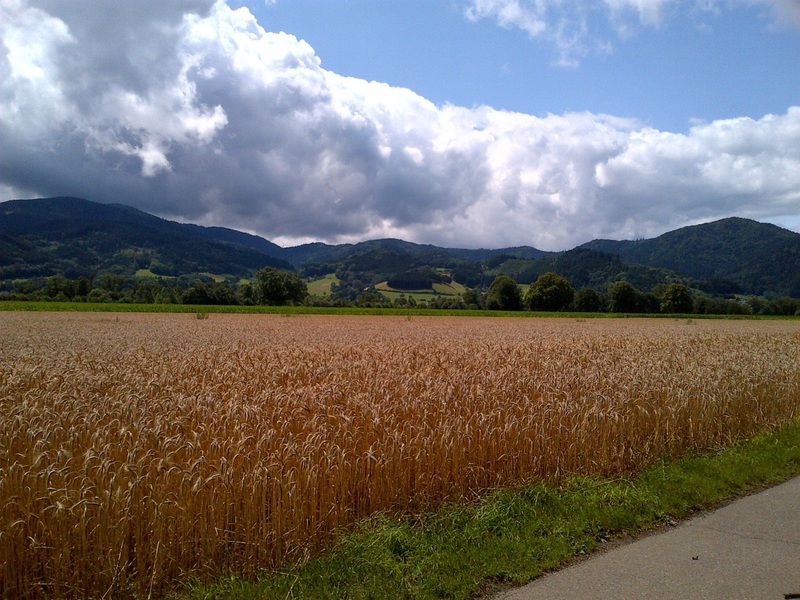 The scenery transitioned seamlessly (see photos below) from busy city blocks, to suburban village-like districts, to sports fields and playgrounds, then under or over the autobahn and out to the bucolic farms with herds of goats and sheep, past acres of corn and wheat fields. There were plenty of intersecting bike trails along the way that I would have loved to explore. We headed west when we meant to go east to find the solar soccer stadium on the outskirts of the city, so had to double back and ended up riding for more than 20 miles, stopping occasionally to take pictures. Once back within the city limits, we found lunch at a Turkish restaurant not far off the Dreisam River trail. While this ride was all very pleasant for me, I still didn’t get the impression that many of the locals were riding for pleasure. The vast majority appeared to be biking solely for transportation. 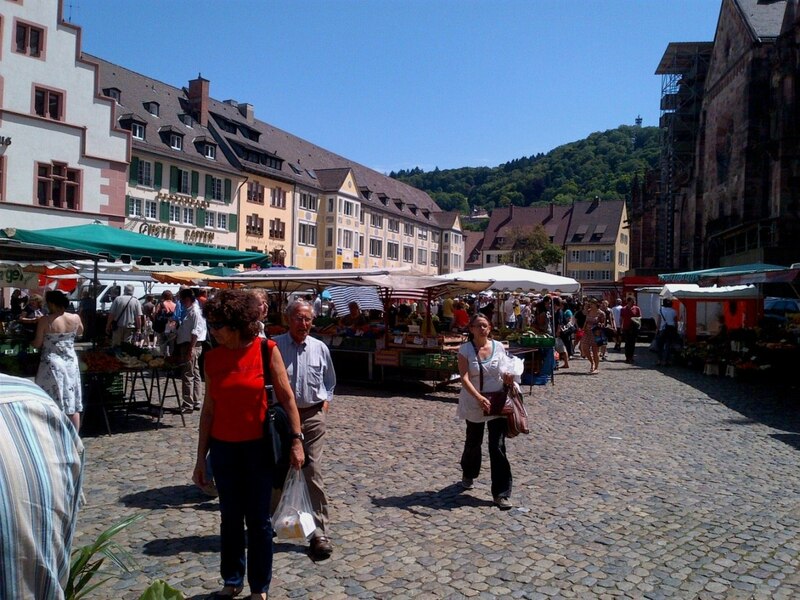 Freiburg proved to me that when biking becomes a lifestyle choice and serves as a mode of transit that literally replaces the use of cars and other motorized vehicles, the population becomes healthier. I’m no slouch on a bike but many of the locals, young and old, passed us as we pedaled along at our leisurely pace. I’ll admit that I found it a little bit frustrating that I couldn’t easily close the distance between myself and an elderly white-haired gentleman in jeans and a t-shirt, or a middle-aged woman in a long skirt, whom I guessed could have been heading to her apartment for a lunch break – not exactly like trying to make up ground on the peloton at the Tour de France. 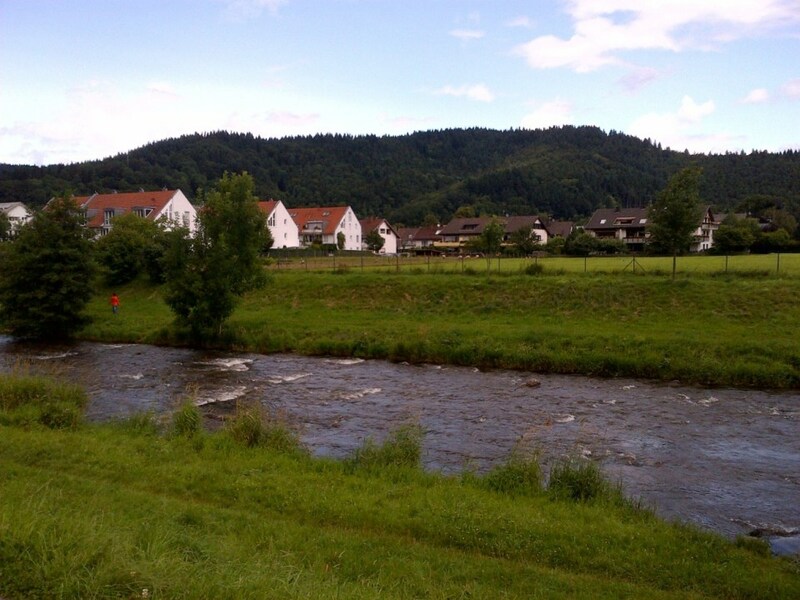 Between biking everywhere, and hiking and mountain climbing in the Black Forest, Freiburgers are in good shape! Or maybe it’s the local beer…. 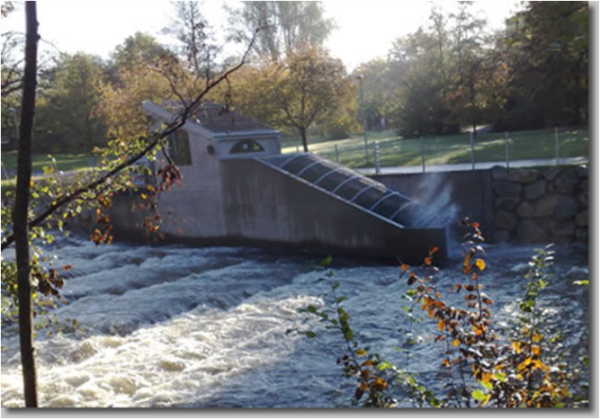 This is series of blog posts by Rich Miller, UConn’s Director of Environmental Policy, comparing and contrasting aspects of environmental sustainability at Freiburg University (Albert Ludwig University at Freiburg or Freiburg Uni) and in the “Green City” of Freiburg, Germany, with similar sustainability aspects and metrics at the University of Connecticut (UConn) and its main campus located in Storrs, within the small town of Mansfield, and the rural surroundings of northeastern CT. Rich received a professional staff travel grant from UConn’s Office of Global Programs and used it to visit Freiburg over a two-week period in July 2012 for this international sustainability exchange program. 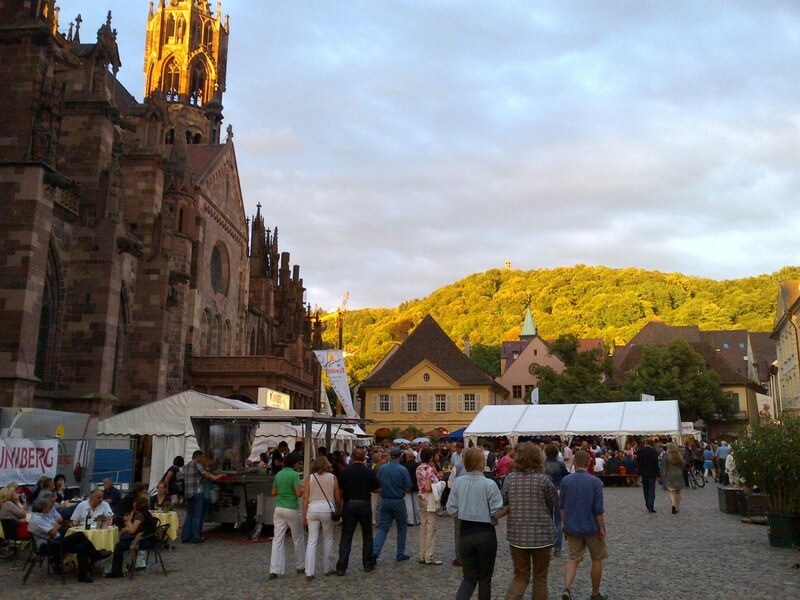 How do the Germans and foreign visitors travel in and around Freiburg? Are alternative modes of transportation popular and encouraged by local government, institutions and businesses? Is public transportation convenient, accessible and affordable to the masses? At first, mass transit in Germany didn’t seem much different from airports and buses in the U.S., at least not based on my departure from JFK airport in NY and my arrival in Frankfurt, Germany. After the short flight to JFK from Hartford, we settled in for a two-hour layover. But as boarding time neared, we were shuttled from the crowded and rather run down international terminal to the new and more spacious one still under construction. Hate to think what would have happened had we not heard the announcement about that gate change and then missed the 15-minute shuttle bus ride across a corner of the busy runway, just in time for boarding. After an overnight, wind-aided 8-hour flight to Germany, I was a little stiff and sleep-deprived, but well caught up on a few recent movies. Once safely on the ground and through customs and baggage claim in Frankfurt, we waited briefly in line for the free shuttle to the train station. On the bus, we were instructed in three languages, German, French and English (thankfully, this is a standard practice for internationally-frequented mass transit systems in Germany), that it would be an 8-minute ride. Accurately timed, I’d say! I compared this precision with the shuttle across the tarmac at JFK, where we waited for clearance at several points along the runway and the driver risked no attempt at such an announcement. 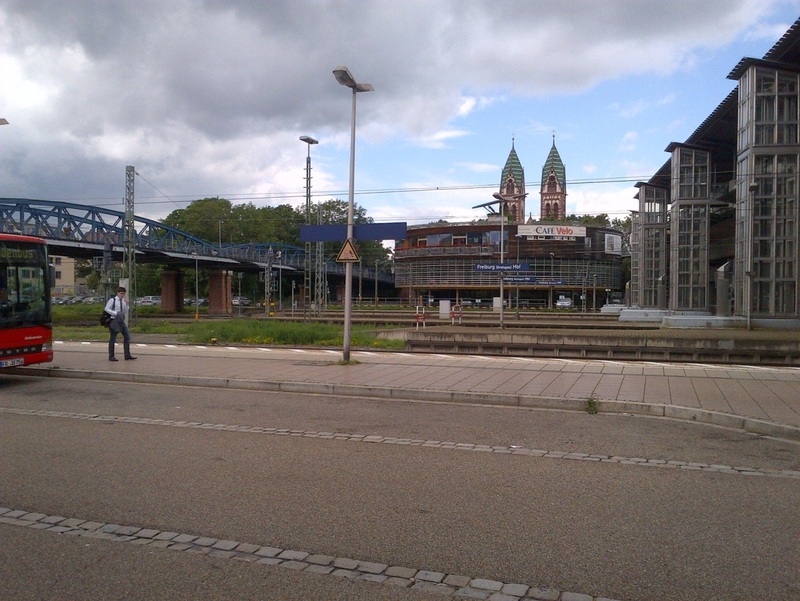 At Frankfurt’s main mega-train station, which, in the US resembles NYC’s Grand Central Station or a mid-sized airport terminal, we needed to find our way to the high speed/direct train line, aka ICE (Inter-City Express), to Freiburg. Through the ICE, the German Railway offers clean, fast and sleek trains with direct connections to several larger cities in Germany and beyond. While this is similar to the newer high speed/bullet trains between Washington, DC and NYC, the ICE covers a much larger area and serves as a convenient, mass transit backbone for most of Germany. The ICE to Freiburg would be a 2-hour ride, costing about $65 a ticket – not cheap, but compared to the price of gasoline in Germany, a relatively affordable option. I saw a gas station sign for regular at 1.57 euros per liter, which translates to about 6 euros/$7.22 a gallon. Of course, the price for everything is higher for us Americans, given the poor euro-to-dollar exchange rate. We hurried to exchange currency and purchase our ICE tickets, knowing that the Freiburg train left at two-hour intervals and not wanting to prolong the trip with a layover if we could avoid it. We made it to the ICE gate with 5 minutes to spare! But as it turned out, the train arrived a few minutes late – something the conductor would later apologize for in his announcements at several stops – in three languages, no less. I wish the overnight flight from the US had been as spacious and comfortable as the ICE train – I might have gotten some sleep. 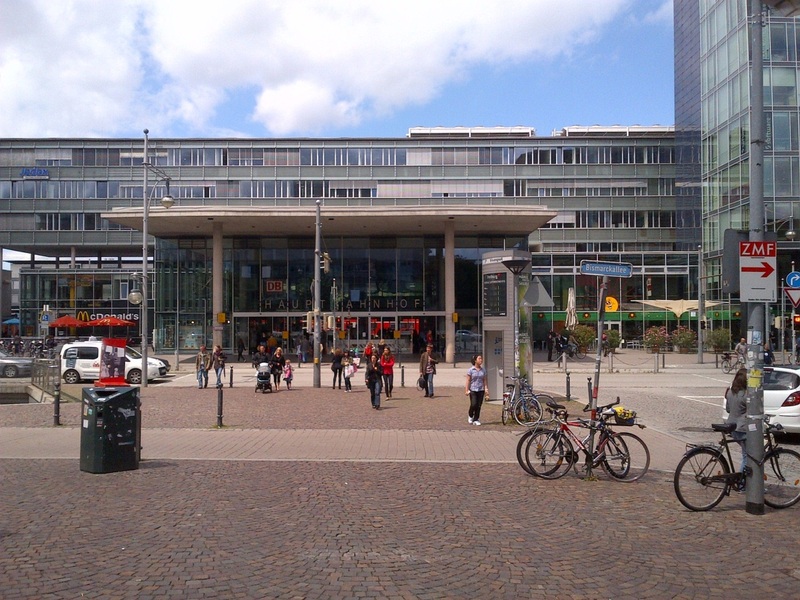 Front entrance to the main train station (Hauptbahnhof) at Freiburg. Freiburg taxis – most of them VWs of course, and all of them fuel-efficient sub-compact cars, were waiting curb-side at Freiburg’s impressive main train station, located adjacent to the bus station and the public bike rental center. This complex served as a combination “mobility station,” shopping mall and city gathering place of sorts – cafes, fast food, grocery and sporting goods stores, bakeries, travel agencies and information stations, crowded with residents, commuters and tourists alike. Outside the train station, I caught my first glimpse of the electric trams, which continuously loop on tracks and cables throughout the city, including stops within the historic Altstadt (Old City), where motor vehicles are mostly prohibited, and at scattered sections of the Freiburg Uni campus. 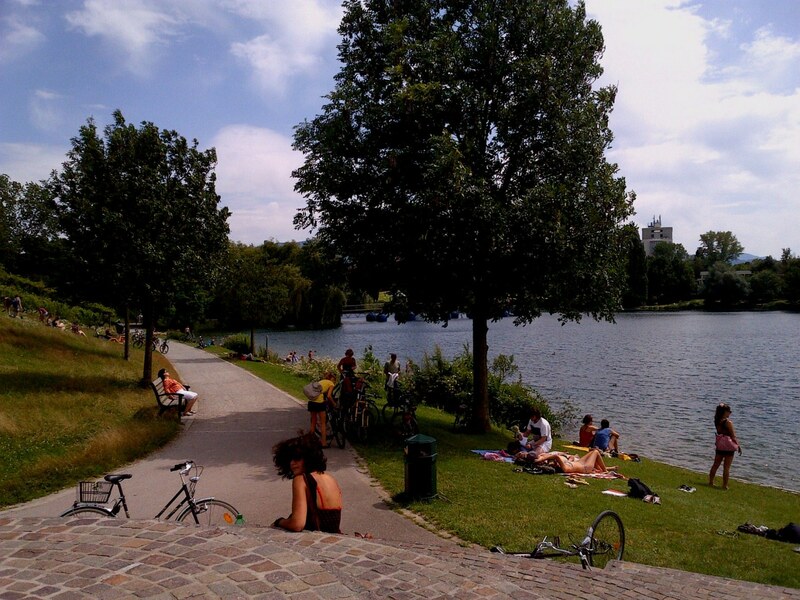 When I took the tram to the city’s Vauban eco-district (one of the many destinations on my Green City map) I found it to be faster than traveling by car or bus, but probably not as efficient as a bicycle, had I known my way around town. Buses in Freiburg generally don’t compete with the trams in the Altstadt or inner-city but instead travel to the outskirts of town and beyond. In addition to transit and commuter buses, there were steady streams of buses arriving and departing daily with groups of tourists and shoppers. 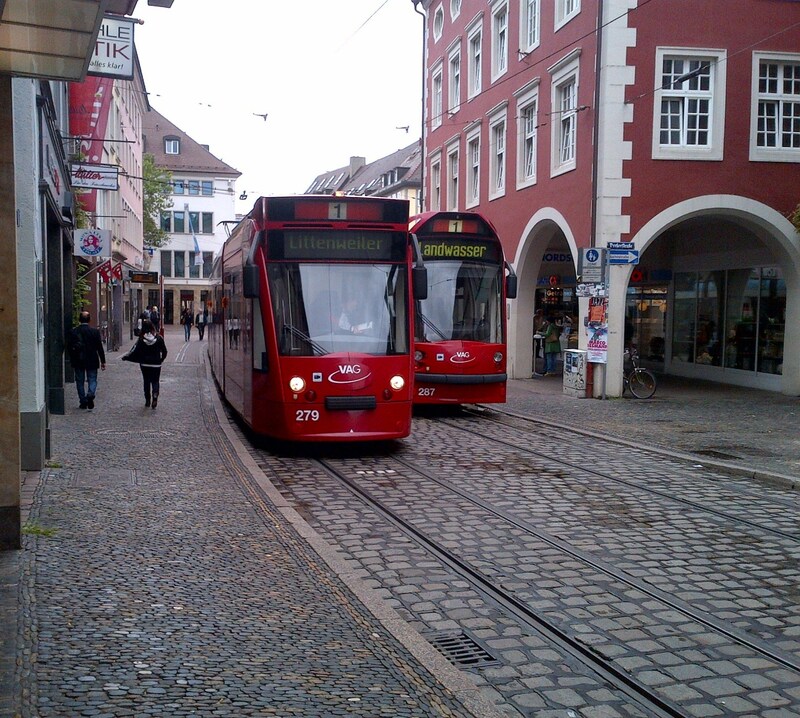 Two of the continuously-looping electric trams wait for passengers to board in Freiburg’s Altstadt. 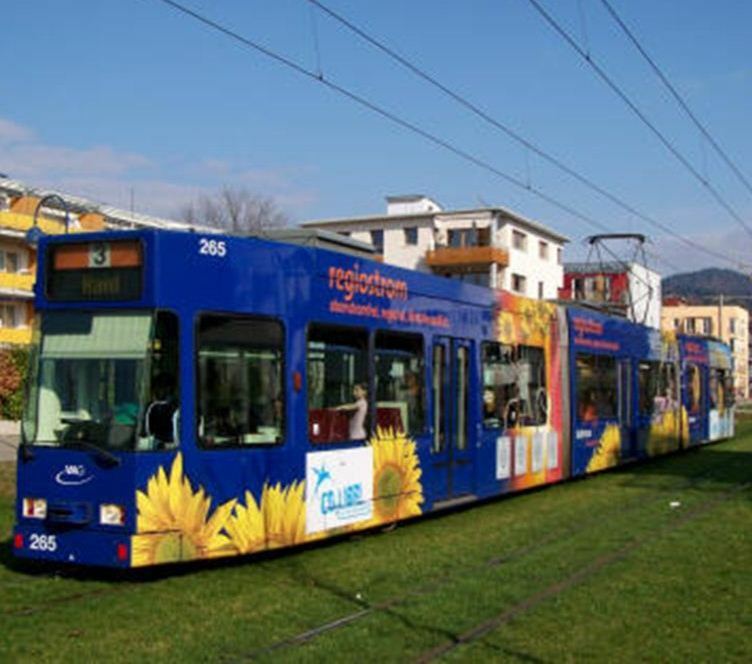 For a few euros or less, the trams will take you anywhere you need to go in Freiburg, from the inner-city to nearby village districts. While there’s no real comparison between mass transit at UConn, in rural Mansfield, with the impressive public transportation network that Freiburg Uni enjoys within a city the size of Freiburg, it’s also fair to point out that UConn has had to piece together its own system for transport on- and off-campus. UConn’s continuously looping shuttle buses are always free to students, faculty, staff and the public. This fall (2012), new streamlined bus routes, designed to reduce wait times as well as total mileage, will be unveiled. During the school year, through arrangements with companies like Mega-Bus, Huskies can find low-cost fares for direct trips to NYC and Boston available daily. If more flexible or convenient transportation to other off-campus destinations is needed, students and others can now rent one of four ultra-low emissions vehicles stationed around campus, available at low-cost hourly rates (gas and insurance included) through UConn’s new car-sharing program, run by Hertz-On-Demand. Back at the Freiburg Hauptbahnhof, after coffee on the ICE train, the restroom beckoned. The one and only “WC” (water closet) or public restroom at the main train station required 0.80 euros (roughly $1) per person, payable at the turnstile entrance. This can be said from my experience – very little in Germany is free of charge – clean, accessible and efficient, yes, but everything at a price. Even this blog comes across the internet at a special discount rate of 5 euros per day (versus 3 euros per hour) from the w-fi equipped hotel.